If our email links don't work for you, contact us here. The Ottawa Valley Quilters Guild (OVQG) was started in 1981 by three quilters - Ann Bird, Joyce Legault and Isabel Johnston. Since that time, we have grown to a membership of about 200. The OVQG was incorporated as a non-profit in 1987. The letters of incorporation may be viewed by OVQG members upon request. The Constitution is available for viewing. The OVQG is a member of the Canadian Quilters' Association (CQA). At monthly meetings members enjoy a rich and varied program ranging from guest speakers and films to participation in group projects, mini-workshops and the always popular "Show & Tell" of members' work. New members are always welcome. Whether you are a novice or an advanced quilter, we are sure the Guild will be of interest to you. Executive & Committee members of the Guild act as hosts to welcome new members and to answer any questions you may have. 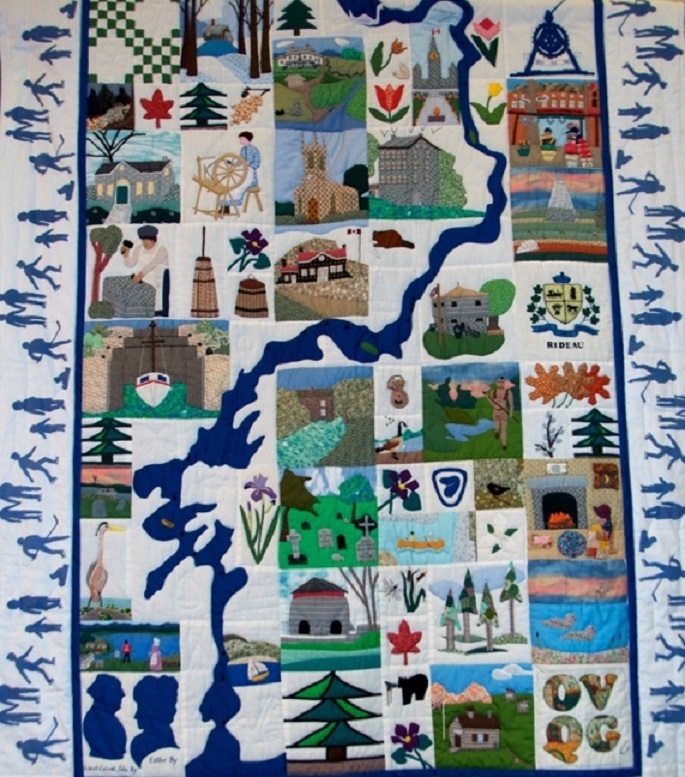 This quilt was designed and created by members of the OVQG to celebrate the 150th anniversary of the Rideau Canal in 1982. It was presented to the Rideau Canal Museum in Smiths Falls in fall 1982 and is on permanent display there.